I was lucky enough to receive a developer's account for Google Wave really early in its pre-pre-launch time window. Unfortunately, Google Wave is basically useless if you are all along. It feels something like having a laptop without an Internet connection. What are you going to do? Play solitaire! Now comes the pre-launch, Google Wave preview, when people are able to invite others. I now have several people in my contacts list that have Google Wave accounts so I have played with it a bit, but not usefully yet. To really understand what Google Wave is all about, you need to use it to accomplish something. The necessity of accomplishing some task and the coincidence the person you are working with has an account has not crossed paths yet in my life. I know people with accounts, but have not found some useful way of using Wave yet. This is not to understate the fact that I have come up with some interesting ways of using Wave, I have just not had the time to implement any of them yet. The biggest use I can think of is using it as the back end for a content management system. This is definitely not an intended use and a lot of work would need to be done to interface Wave with a functioning website. Another way I hope to use Wave is as a real time collaboration platform for some of my class work. I currently use Google Docs for many of my classes where I work on a team. The near real time functionality of Google Docs is nice, but it is not perfect. There is a delay and it can cause problems. With Wave, two people can literally be editing the same sentence. At this point in time I really do not have that much to say about Google Wave. I recognize it as a very important platform that will help drive the Internet forward, but is Wave too early? Will people be able to find ways of using it? Most other Google products are simply better versions of tools that are available from many other companies. What makes Google special is that it keeps things simple while providing innovative features, think Gmail. Google Wave is very exciting and I hope slowly integrate into my daily Internet connected life. To start off this review, I will make it clear that I did not purchase my Fujitsu T5010. I won it at the WIPTE 2009 conference in a drawing. I have had about 2 days to play with it, and have not used it to take notes in class yet, but I have a good feel for the device. I was initially disappointed that it did not ship with Windows 7. Since it shipped before the Windows 7 launch date, I should have expected it to have Vista. There was a lot of pre-installed software included on the computer and the first boot took a very, very long time. The bells and whistles that Fujitsu included in their Vista build really seemed to slow the system down and were just not to my liking. Luckily I have a lot of copies of Windows 7, so after a few hours of playing, I installed Windows 7 Home Premium. However, this should not be held against Fujitsu since all of the manufactures do the same thing. My preference is to run a clean copy of Windows, the way Microsoft intended. My biggest disappointment is the lack of Microsoft Surface applications. However, this is Microsoft at fault here. At this point in time, only OEM's are able to pre-install them on computers, meaning I will need to wait for them to be released to the public before I can use them. The screen on the T5010 supports both Wacom pen input and two points of capacitive touch. The screen behaves very nicely switching between the inputs, although the tip of the pen does not feel very good on the screen and needs to be broken in some. 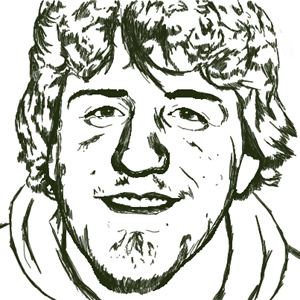 Both Paint and IE8 support multi-touch, so I have played with it a bit and enjoyed the experience so far. The touch is not as accurate as I would like, but I think most of this is how the software is handling the input. The overall size of the computer is far larger that I would prefer. This is primarily due to the fact it includes a built in optical drive. While my Toshiba M405 included a built in optical drive, the T5010 has a slightly larger screen and the overall bulk is what I would consider the maximum size that a student would want to carry around. While I know many people who carry around 15 inch and even 17 inch computers, the biggest I would recommend is 13 inches. Compared to my HP EliteBook 2730p, the T5010 looks massive. My experience installing Windows 7 was fairly smooth with no major problems. However, unlike my experience installing Windows 7 on HP computers, the drivers were not automatically found by Windows Update. However, the drivers for Windows 7 were available on Fujitsu's website for download. This is fine for a computer geek, but someone less technical may have some problems. Overall, the T5010 is a very feature rich Tablet PC. 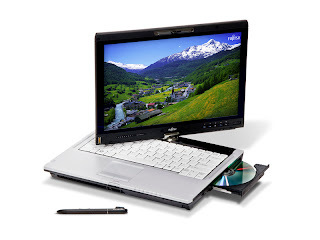 With both pen and touch inputs, a built in optical drive, built in webcam, and some other interesting features, it is very versatile computer. The main thing that stands out is the fact the screen can rotate in either direction. While this isn't really a major productivity booster, it is interesting that they managed to make a hinge that can go either direction. It seems that it will hold up over time, but that takes time and abuse to really make a judgement. I am going to finish setting up the computer over the next few days so I can use it to take notes in my classes and will give it a chance. However, the fact it is so much larger than my HP Tablet PC, I will likely not change my primary computer. Thanks to Live Mesh using more than one computer is not a problem. It is nice to have a 'reserve' Tablet PC, and with Mesh syncing all of my files, I will probably end up leaving my HP in my backpack when I get home work just use the Fujitsu at my desk. 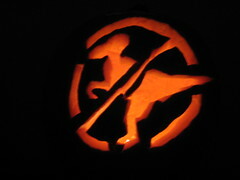 Cassie carved the above pumpkin today for Halloween. It was so awesome I thought I would share, even though she said I am "totally stealing her intellectual property" by posting the picture on my blog. 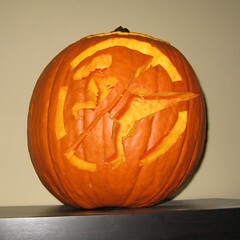 No matter the case, it still is an awesome pumpkin. As a Computer Engineering & Computer Science major I have a lot of experience keeping a computer up and running smoothly. Actually, I have quite a few personal computers that I keep up and running. So do almost all of my classmates in my major. I keep my antivirus up to date, expect the monthly updates for Windows, avoid creepy / dangerous software, and backup regularly. The requirement for all Speed School Students to have a Tablet PC for the use in the classroom has proven to be a very interesting. With a total of 7 different majors, not everyone is an expert computer user. Requiring students to manage a computer that is mission critical for their education is a difficult proposition. What is the underlying problem? The average computer user is not skilled enough using Windows to keep it up and running without any problems. Excluding the abuse of hardware, which should be expected from any educational environment, the main problem is software. At this point, many people would point to Windows as the problem, but I will take a step back and attempt to identify the underlying cause. Since the requirement for student's is a Tablet PC requirement, the only choice in operating systems is Windows. While Linux provides some support for pen based input, it is years behind what is offered on Windows. While Mac has the possibility of a 3rd party tablet, it is targeted towards graphics and not towards students. Windows is really the best option, and with Windows 7 it is actually a very powerful and friendly operating system. From personal experience, I have been very successful at using my Tablet PC in class to take notes. Many of my friends have been very successful as well. In a simplified model of reality, there are three classes of computer users. The first class, highly skilled, I would put myself in this category along with most CECS majors and many of my friends. A highly skilled computer user has no problem troubleshooting their own problems, they build their own desktops, they rarely contact tech support for anything other than a hardware problem, and keep their computer running smoothly almost all of the time. How is this type user able to do all of this? The simple answer is they are not afraid to tinker and guess. This type of computer user experiments, makes mistakes, and learns from experience. This type of user at one point in time was my next type of user. The last class, casual, is probably what most of the general population falls into. A casual computer user is able to use a computer for general computing tasks such as word processing and surfing the internet. In general, this type of user may be extremely competent in using the internet, but not knowledgeable about how to keep their computer up and running smoothly. This user does not always know they need to install updates, and unless they have patching set to automatically install them, they may be horribly out of date. They may or may not be running antivirus. Additionally, this type of user may make some bad decisions such as disabling their firewall or installing dangerous software. When their computer works, they are typically just fine, but if they run into a problem such as wireless not connecting, they may have trouble fixing the problem on their own. While any class of computer user has the possibility of catching a computer virus, a casual computer user is most likely to continue using their computer after it has been infected with a virus, even as the performance of the computer is dramatically reduced as a result of the infection. I strongly believe that an Engineering student, regardless of their major, should be a skilled computer user by the time they graduate. While many students will not enter college with the necessary skills to manage their own computer, they should be required to learn how to over time. Should these skills be covered in a specific course? No. These skills should be acquired in the spaces between the rigidly defined curriculum. In our modern society, regardless of your field in engineering, you should graduate college as at least a skilled computer user. If your job expects you to design bridges, manufacture chemicals, manage projects, model a assembly line, or implement any complex system, at the very least you should be able to fix your wireless problems and keep your computer up to date and virus free. This is just a summary of my experiences with various Tablet PC manufacturers. My first Tablet PC was a Toshiba and my girlfriend used a Gateway Tablet PC for several years. I have since moved on to an HP Tablet PC and my girlfriend is currently using a Lenovo Tablet PC. Additionally, I recently won a Fujitsu Tablet PC at WIPTE 2009, but it is in the mail and I do not have much experience with Fujitsu yet. The last manufacturer I will talk about is Dell, while I do not have experiences using one personally, I have experience supporting students who own a Dell Tablet PC. This review is focusing more on the quality of the product and not the price. While it is impossible to remove price entirely from the evaluation of the product, it is not the main thrust of this review. This review is meant to be more of a summary of my experiences with Tablet PCs thus far and the opinions expressed here do not represent a detailed analysis of the entire line of products offered by each manufacturer. I have the most experience with this manufacturer as my Toshiba M405 Tablet PC was not only my first Tablet, but was also my first "laptop." When it comes to a Toshiba Tablet they are generally a very sturdy machine. However, they have not mastered making a sturdy hinge. To help solve this problem they have added lock-in clips on each side of the screen on their newer Tablet PCs to stabilize the screen. This causes a newer Toshiba Tablet to look more like a laptop than a Tablet. Toshiba is in general a quality manufacturer. When it comes to quality, the product will last but may not age gracefully. I know of several Toshiba Tablets that look very worn out, but they are still working. The feature combinations present in some Toshiba models will likely be very attractive to a consumer that is looking for a specific feature set. Toshiba Tablets come in some of the largest screen sizes and their smaller models come with built in optical drives. Overall, Toshiba is not a bad choice, but it is not leading the pack. This is a very simple conclusion to reach, avoid any and every Gateway Tablet PC at all costs! These computers are absolutely terrible. From three years ago, I know almost no one who is still using their Gateway computer they had when they entered college. The build quality is sub-standard, the warranty is nearly impossible to use, and the user experience is generally unpleasant. Many people are tricked into purchasing a Tablet PC because of the low price, but they are not even worth it at the lower price point due to all of the problems. The problems that have plagued Gateway Tablet PCs include overheating, power system problems, poor pen quality, and a general degrade in quality over time. Most Gateway Tablet's do not use the Wacom digitizer, which provides for a much worse user experience when used as a Tablet. Often times a Gateway Tablet will end up being used like a laptop because the digitizer is simply so bad. While this is a generalization of an entire product line, all of my experience points leads me to this conclusion. I would like to point out that Gateway Inc. was purchased by Acer in 2007 and many of the Gateway products I have experience with were built before 2007. However, I hold to my recommendation to avoid Gateway Tablet PCs. HP has a split personality when it comes to their Tablet PC lines, so I am forced to review them as if they were two manufactures. In essence, they are truly two manufacturers when you compare the build quality and features that make it into each of their lines. An HP consumer model Tablet PC is the type of computer you will find in Best Buy. Unfortunately the price point is so low, like the Gateway computers, many consumers are tricked into purchasing them. These computers have been coming in a black color lately and promote multi-media features. The processor is typically AMD which is how they are able to drive down the price. Interestingly, they often include an optical drive in the smaller form factors, but this does add to the overall size of the product. However, the main way they are able to drive the price down is by using sub-standard digitizer technology. Some models use only resistave touch with a stylus. As a result, these Tablet PCs (using that name very loosely here) have been come to know as "Crap Tablets" at Speed School because they are just a terrible user experience. There are other models that use active digitizers, but it seems that they are not all using the standard Wacom technology. Even when these models use a Wacom digitizer, the quality of the pen input is lacking. When it comes to overall build quality, the HP consumer Tablet PCs are not built to last. My experience with these computers include damaged screens, broken power supply connectors, and general operating system instability due to hardware problems. My overall recommendation is avoid these computers unless absolutely necessary for budgetary reasons. While these computers are not as bad as the Gateway lines, they are prone to failure in an abusive setting such as a student's backpack. When it comes to a rock solid Tablet PC, HP has an excellent position in the market. The previous generation tc4400 and the current generation EliteBook 2730p are rock solid computers when the right balance of features. While the lack of a built in optical drive may seem like a downside to many people, the savings on bulk and weight are well worth the trade off. The digitizer is very high quality, although the old style HP pens are prone to snap in half. While the price is significantly higher than an HP consumer model, with higher specs in a line for line comparison often favors the consumer model, the cost is sunk into the build quality making the business model the better choice. My preliminary analysis is that students who entered school this year with a 2730p will still be using the same computer in 4 years. When you compare that to what my class has experienced, many individuals who are entering their 4th year are on the second computer. The biggest problem I have encountered with these computers are the crap-ware that is bundled with the manufacture's build of Windows. However, this problem is solved by simply reinstalling Windows (hopefully Windows 7) and not installing the software that is bundled by default. However, this is nit-picking as every manufacturer does this. My overall recommendation is that an HP business class Tablet PC is a purchase that will be hard to regret. The problem with saying that a Lenovo Tablet PC is an excellent computer is that the quality of the line is not limited to the Tablet PC series. Lenovo computers are very rugged and will last for many, many years. When someone expresses interest in purchasing a Lenovo Tablet PC, my response is typically, "Great choice, enjoy your purchase!" I have not met a single person who regretted purchasing a Lenovo Tablet PC. My experience with Lenovo includes my girlfriends second Tablet PC, which she uses to take all of her class notes. As a point of comparison, she never used her Gateway to take notes, and now she only uses her Lenovo to take notes in class. The biggest downside people immediately point out is the lack of a touch pad, but to those people I say try using a track point before you judge. On my HP computer which has both, I exclusively use the track point as the input device. The biggest downside of a Lenovo is typically the price, but when you look at how long the product will last it is not something that should be considered. Just to emphasize my conclusion, Lenovo is one of the best manufactures of Tablet PCs and is in a league of their own in quality. My experience with Fujitsu is very limited. Two professors that I have worked with both have Fujitsu Tablet's because of the 13" screen. They are very happy with their decision to go with Fujitsu. At WIPTE 2009 I was able to play with some of the Tablet's that are in the Fujitsu line of computers. Additionally, I won a brand new Fujitsu T5010 from a prize giveaway at WIPTE 2009. I have not received the computer yet, so I can not provide a full review. However, I can speak some to the quality of Fujitsu in general. Since Fujitsu is not new to the Tablet PC market, many of their products are highly refined. Their line of Tablet PC's is one of the largest if not the largest so the quality within the line does vary, similar to the difference between the HP consumer Tablet PC and the HP business Tablet PC. My recommendation, although not as informed as I would like, would be to go with Fujitsu if it meets your needs from a feature standpoint. With such a wide range of options provided by Fujitsu, they have Tablet PCs at sizes that are slightly larger and slightly smaller than the rest of the market. This translates in some of the models being slightly niche, in a market that is already niche. However, I have high hopes for my new Fujitsu Tablet PC and would recommend someone purchase a Fujitsu if it meets their needs. Dell is the leading computer manufacturer in the United States. Michael Dell famously stated that Dell would not sell a Tablet PCs, but years later ended up introducing the Dell Latitude TX and then the TX2. Dell Tablet PCs, at this time, do not use a Wacom digitizer. I can already recommend that Dell Tablet's should be avoided simply because they do not use the Wacom technology! This recommendation is magnified if it is going to be used in a heterogeneous Tablet PC environment where everyone else has a computer that supports a Wacom pen. It is extraordinarily frustrating when you attempt to use a Wacom pen on a Dell Tablet PC and it simply does not do anything. However, Dell does offer some interesting features, mainly touch support. While the Dell touch drivers were plagued with problems when they first launched the platform, it seems to be working now. Touch will continue to become more and more important in Tablet PC lines, but it will never replace the need for an active digitizer. My experience with Dell is not long enough to give an estimate on how long they will last, but in general the machine is well constructed. Overall, I will still give the recommendation to avoid purchasing a Dell Tablet PC. Unlike my recommendations to avoid other Tablet PCs based on build quality, the recommendation to avoid the Dell is based on other grounds. While the main reason to avoid a Dell Tablet PC is that it is not using a Wacom digitizer, the other reason is product generation. Dell is only on their second generation of Tablet PCs while other manufacturers are in their double digit generation numbers. While Dell may eventually develop their Tablet PC line to be a major contender, it is still too early to recommend. Once Dell is on their 5th generation of Tablet PCs, I would feel a lot better recommending a Dell Tablet. This past Monday and Tuesday WIPTE 2009 was held at Virginia Tech. I attended WIPTE last year, but only for one day and not the entire conference. Since Virginia Tech is 6 hours away from Louisville I ended up attending for both days. The conference was a lot of fun and there were a number of presentations that were related to the work I have been working on. I co-authored a paper with Dr. Hieb and Dr. Lewis titled "Using Retrieved Panels from DyKnow for Large Classes." The purpose of the paper was to explain how the calculus classes at Speed School use DyKnow to collect the in class problems. An in class problem is essentially just a single page problem that all of the students complete. Typically it is something simple that is a new topic that is being introduced or a problem that was from the homework or previous test. The main point of the in class problem is attendance, but also encourages student's to use their Tablet PC and cover some of the material from class. The trick is there are hundreds of students taking calculus every semester so it requires the processing of almost 1000 panels each week. The software that I wrote to automate this process was the main focus. The presentation I gave at WIPTE went over very well. It covered a lot of the work that I have done since the paper was published. This was mainly the software that I have been developing called DyKnow Panel eXtractor. The software that I currently have published is able to sort a DyKnow file's slides by the name or user name associated with each panel. Another piece of software is the replacement that I am developing to replace the current version of the tool used to manage the in class problems. Lastly, I have a program that can open a DyKnow file and display the panels and also read in the names associated with panels. The part of the presentation that was impressive is that someone in the audience download my software during the presentation, installed it, and used it successfully. This was really luck since the software is definitely still in alpha and under major development. Overall, lots of people were excited about the concept of developing applications that use DyKnow as a platform. The other big thing that happened at the conference was the prize give aways. They gave away two HP Tablet PCs and two Fujitsu Tablet PCs. I ended up winning a Fujitsu T5010 Tablet PC when my name was drawn from everyone who filled out the final evaluation for the conference. There were probably 100 people that were in the drawing so I was very lucky to win the Tablet. They are shipping the tablet now, but I will not have it until next weekend. The main reason I am excited about getting it is because it has support for duo-touch and can run Microsoft Surface applications. I will be looking into developing something that uses the touch features of Windows 7. After I get it I will post some type of review. Considering that the NAESC Southeast regional conference was immediately before the WIPTE conference, this was a very crazy fall break for me.